This is a surprisingly easy problem to solve and I have seen widespread success from 5th grade classrooms to elite graduate seminars in higher education. My go to advice? 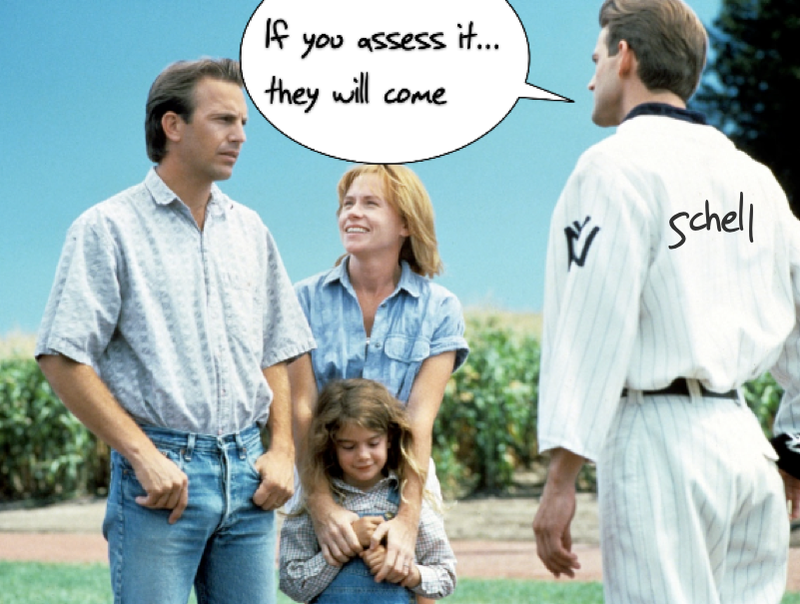 A sticky little phrase I came up with through conversations with an experienced university flipper: Assess it, and they will come (a play on the popular phrase from Field of Dreams). Turn to Your Neighbor readers seem to agree. In an unscientific poll with 573 respondents, 87% believe that students will do out of class work if you provide them credit for doing so. Simple enough? In this post, I am going to introduce two magical tools to help you answer this question. I am calling the two tools magical because they are simple, low-threshold things you can try right away to significantly improve student success. In a recent study, Harvard researchers Karl Szpunar, Novall Khan, and Daniel Schacter (2013) identify a potential winning combination for implementing a flipped classroom with online lectures for pre-class work that combines the carrot of assessment with the reward of deeper learning. They give the approach a fancy name that belies its simplicity, “Interpolated Memory Tests.” Let me translate. The general consensus among cognitive scientists and experienced teachers is that when you are asking students to watch online videos to prep for class, you must “chunk” them. That is, don’t make them longer than 5-7 minutes if you want students to a) watch them and b) be able to process what they are watching. The most effective pitch I have ever seen for short videos came from a 4th grader on a panel at FlipCon13. From the stage to a crowd of about 200 teachers, she said with pleading and concerned voice, “The longest video I had to watch was 27 minutes.” You could hear a pin drop in the silence of empathy. Let me be clear, she was not complaining, rather pleading for teachers to listen to scientists about short videos. So – magical tool number 1 is, drum roll: chunking. Here is what a cognitive scientist and an experienced flipper would say to do with that video: Chunk it. Take those 27 minutes and break them into four, seven minute sequences. Make sure you have a pause between the sequences. But don’t stop there. Szpunar et al. found that when you interpolate, or place, memory tests in between video chunks, it pairs students with memory’s best friend, retrieval practice. Every time students at any grade level have to retrieve information, this exercise improves their memory for that information. Indeed, in a extensive study of 1,400 middle school students, memory expert, Pooja Agarwal (2012) found that “retrieval practice in authentic classroom settings improves long-term learning” (p. 437). What exactly is retrieval practice, in layperson’s terms? In a recent conversation, Agarwal told me: “it is the idea that practicing recall of information from memory subsequently enhances and boosts memory.” So, if we want students to retain what they are learning through pre-class videos, what’s the best thing we can do? “The best thing we can do is [give them] practice! Practicing retrieval makes perfect – the more you engage in retrieval practice, the better your memory for pre-class videos” Agarwal told me. What kinds of questions should we ask students in between those chunks? “Multiple choice or short answer, our research shows that either kind of quiz question helps,” says Agarwal. And how many questions should there be? The more the better, Agarwal confirmed when I suggested that quantity. Szpunar et al. chunked a 20 minute video into four, five minute segments and asked six questions after each segment, with a final quiz at the end. They found that this protocol resulted in students taking more notes during the lecture videos and performing better on that final quiz, both results were statistically significant as seen in Figure 1 below. The second best thing you can do to make sure your students learn from your pre-class videos is to email Agarwal at ask@retrievalpractice.org to learn about a guide on retrieval practice she and her colleagues are creating specifically for teachers and check out her research on the topic. If you are looking to take your flipped classroom to the next level, try chunking your videos and pairing them with memory’s best friend, retrieval practice. In general beginning a class with new material gains students best attention. I was wondering if that would hold the same here. Would it be better to begin with the chunk or the practice questions?